The Wet-Detective is brought to you by PottyMD, LLC. Our goal is to be the best resource for bedwetting and incontinence issues for children, adults, and their caregivers. Our team of bedwetting and incontinence experts have developed the Wet-Detective and other bedwetting products with children, adults, and comfort in mind. We want to provide the most affordable, quality, and results-oriented products and education. We are always willing to discuss your particular needs and concerns. 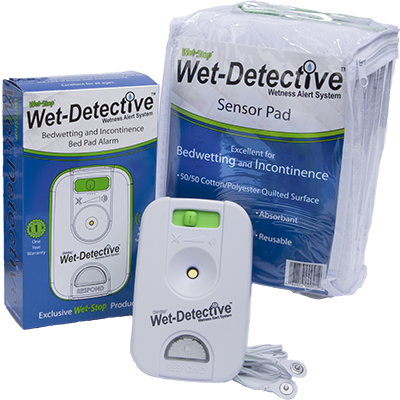 The Wet-Detective Wetness Alert System is bringing state-of-the-art technology to bedwetting and incontinence alarms. Please contact us if you have any questions about our products or if you would like more information. Support Staff Our staff is dedicated to helping and assisting you in any way. Their focus is to provide the best service and accountability. The team of customer support has years of experience in resolving customer concerns. We are responsive, reliable, and experienced. Products Our products are designed by a Urologist and specially selected to be cost-effective and result-oriented. Our books and educational materials are written by us to give you complete information about all treatment options. Many of our products are produced by us and not available elsewhere. We are constantly reviewing new ideas and products for incontinence, potty training, dysfunctional voiding and bowel habits, constipation, and bedwetting. Our staff are available to provide you with ideas and suggestions that are tailored to your problem and situation. We do not advise you to purchase products unless they will help. We want results just like you.